Height: 6' 3" Weight:213 lbs. Background: He is one of the most popular players in franchise history and remains a pillar in the community. As a player, the expectations for Archie Manning were over and above any reasonable expectations. He was cursed by bad management and an overall lack of talent around him in New Orleans which did not allow him to be part of a winning team with the franchise. Still, Manning accomplished much in his stay. After all of these years, Manning still ranks second in passing yards (21,734) and third in passing touchdowns (115) in franchise history. In his rookie season of 1971, Manning guided the Saints to a 3-5-2 record, respectable for the young franchise, in the games he started in his rookie season. In 1972, Manning led the league in pass attempts (488) and completions (230). It was tough, though. Manning was hit frequently and hit hard. He endured 340 sacks in 11 seasons played with the Saints. He missed the entire 1976 season following surgery on his right (throwing) shoulder. Manning was finally surrounded with a competent offensive line and a wealth of skill players, including Tony Galbreath, Chuck Muncie, Wes Chandler, Ike Harris and Henry Childs by the late 1970's. Results followed. In 1978, Manning guided the Saints to a 7-9 record, the best in team history, to that point. For his exploits, Manning was named NFC Player of the Year by UPI. 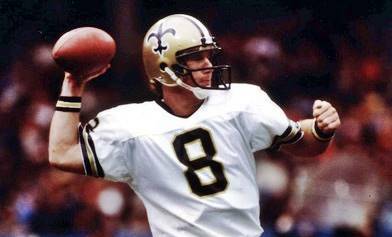 In 1979, he led New Orleans to an 8-8 record, narrowly missing a first-ever winning season. Despite the team falling apart in 1980, Manning played quite well for a 1-15 team. A tremendous runner, Manning rushed for 2,197 yards and 18 touchdowns, making him perhaps the best dual-threat quarterback of his era. Bum Phillips traded him away in 1982 to Houston and he would finish his career with Minnesota in 1984. Greatest Moment: It had to be Manning's first professional regular season game. On Sept. 19, 1971, the Saints played host to the always tough Los Angeles Rams at Tulane Stadium. The Rams were 9-4-1 in 1970 under George Allen. They would finish 8-5-1 in 1971 under first-year head coach Tommy Prothro. After being tied 3-3 at halftime, the Saints grabbed the lead as Manning connected with Dave Parks on a six-yard touchdown pass in the third quarter to give the Saints a 10-3 lead. After Bob Gresham increased the lead to 17-3 on a two-yard touchdown, the Rams stormed back, scoring 17 unanswered points to lead 20-17. With the clock winding down, Manning led the Saints on a game-winning drive, capping it off with a one-yard touchdown run on the final play of the game. Manning fumbled when hit but he was ruled to have crossed the goal line before losing the ball and the Saints won 24-20. Manning completed 16-of-29 passes for 218 yards with a touchdown and an interception and he rushed four times for 14 yards and a score. It was a smashing debut. 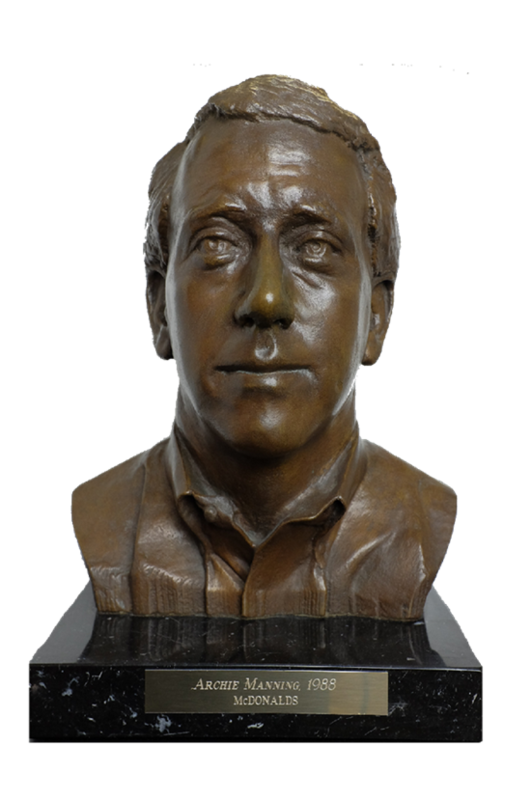 Honors: Manning was an inaugural inductee into the Saints Hall of Fame in 1988. He was one of the three inaugural inductees into the Saints Ring of Honor in 2013. Manning was the UPI NFC Player of the Year in 1978. He was a Pro Bowl player in 1978 and 1979. He was named first-team All NFC in 1978 and 1979. He was inducted into the Louisiana Sports Hall of Fame in 1988 and was inducted into the Greater New Orleans Sports Hall of Fame in 1989.